We admit it. Registering and logging into an app with an email address and password is a pain. The good news is that we’ve just integrated WorldMate 2.5 for iPhone with Facebook, so that you can now register and log-in to WorldMate with your Facebook credentials. It’s fast, easy, and no more “what was my password for this app?” again! In keeping with the social theme, it’s now even easier to post your trip updates on Facebook. 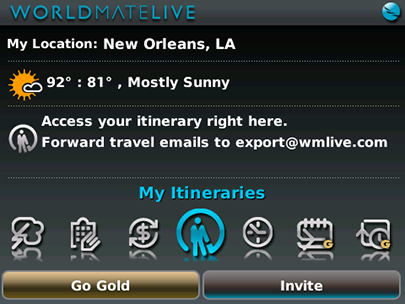 For those of you with iPhone OS5, you can tweet your travel adventures from WorldMate as your trip unfolds. One last thing- Do you ever wonder if the hotel room you booked is really a good deal? With our new Price Alert service, we’ll put your mind at ease by notifying you if there’s a better price for that hotel room, a comparable hotel for a cheaper price, or if there’s a much better hotel for slightly more. In many cases, you can cancel your original booking without penalty and then re-book the better deal through us. 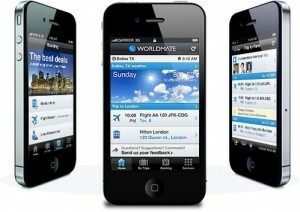 We’re very excited to announce that WorldMate for iPhone 2.0 is now available on the iPhone App Store. We’ve redesigned the app from the ground up and added all the latest iOS features to make organizing your travel plans an even better experience. You’ll love the beautiful new design of WorldMate 2.0 for iPhone; based on feedback from thousands of WorldMate users we’ve made everything nicer and easier to find. We have added support for more details about your reservations, so each item in your itinerary now contains more details from your original flight/hotel/car reservation email. WorldMate for iPhone now supports multi-tasking, fast app switching, Retina display and you can even open the app directly from a WorldMate import email. October 28, 2010 – Emoze, the award winning provider of mobile, push email solutions is proud to announce that it now supports the Apple® iPhone® as part of its enterprise software platform. Long a front runner of the consumer smartphone market, the iPhone® has many features which make it an attractive business tool. Emoze Enterprise Server is already available for WinMobile and Symbian mobile operating systems and now extends its smart management tool to the mail functions and personal information management of iPhone® mobile devices, providing business owners the control and handle of iPhones as secure business tools.